For Toronto-based bass music sensation Zeds Dead, the “dead” of winter marks the best time to launch their biggest tour to date… and this time their bringing friends along for the ride. 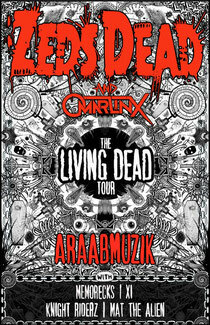 Beginning on February 19 in Vancouver and running through to the end of April, the Living Dead Tour see’s Zeds Dead, Omar Linx, Araabmuzik + other guests travel across North America by bus. With over 70+ shows already confirmed – including spots at the Ultra Music Festival, SXSW and Coachella – there’s a good chance The Living Dead Tour is coming to a town near you. The Living Dead Tour stage production is being designed by the same team that created Deadmau5 and Skrillex's revolutionary shows and involves over 15 separate LED screens positioned at various spots around the stage. In addition to welcoming Toronto rapper/frequent vocal collaborator Omar Linx and MPC wiz Araabmuzik to the the tour, Zeds Dead is putting the final touch on a brand new mixtape which will be free for fans to download later this winter. The tour comes just a few months after Zeds Dead finished up their Fall/winter 2011 Graveyard Tour, which played to large scale venues in over 65 different markets. While on the road, Zeds Dead released two critically acclaimed EPs – ‘Rumble In The Jungle’ on Diplo’s Mad Decent label and ‘Ruckus The Jam’ on Steve Aoki’s Dim Mak Records. Their most most recent release – ‘Adrenaline EP’ is getting play on BBC Radio1 and support from the likes of Mistajam, Zane Lowe, Annie Mac and more. The band is currently supporting the release of ‘Adrenaline’ with a massive 10-date tour throughout Australia – each date being completely sold out!